- The conditions had been more less than the years before! 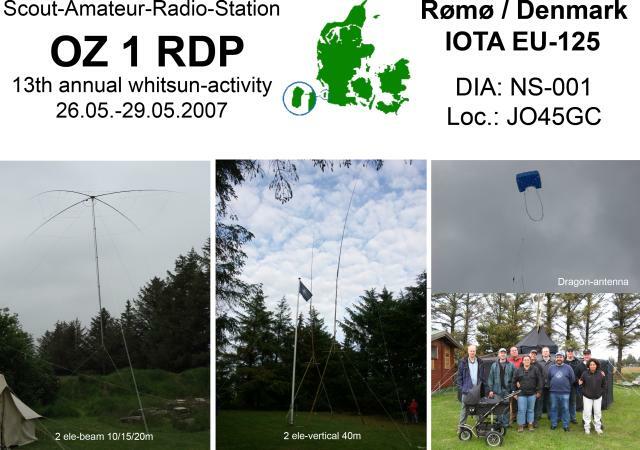 - The 2-ele-vertical for the 40m-band stood intact the whole weekend without any breakch. Instead of 10m long Spieth-glassfiber-towers this year 12m long (more heavy,but more solid) glassfiber-towers from Spiderbeam were used. But one antenna-element had to by mount again few times, because the wooden construction was made by fresh poles and some elements of the tower were inserted after movements by blowing of wind. - Matzes Moxon-Beam again worked excellent. Of course it was raining on the last day - so the tents were not the only which became wet! Jurte, ready build up. Behind it the 2-ele-3-band-Moxon-beam. Both wooden constructions, extended by 12m long Spiderbeam-glassfiber-towers, the elements of the 2-ele-40m-vertical. The antenna rising was made successful by teamwork.